During 2013, the bikers responded to requests from 262 hospitals, for urgent transport of whole blood cells, platelets, plasma, serum, surgical instruments, patient notes, X-rays, human donor milk, and MRI scans. Requests to one of the two or three bikers on duty within a local area, usually come via telephone texts like ‘Urgent blood sample from Peterborough to Birmingham’. It may be that the blood has to go to a specialist testing laboratory with the results required for a patient early the next morning. Within minutes the biker is on their bike, riding off into the night to the pick up point. At the pick-up point a technician on night duty hands over a specially sealed sample box, the biker hands over a receipt, and the package is secured in one of the bike’s panniers. At the destination, a theatre technician in their scrubs may be waiting at reception to take the package. Then they vanish back inside. The biker service is organised into regional groups, so if it is a long journey, the trip is done in relays and the biker passes the package over to another biker at a midway point. The work of each group is co-ordinated by a controller, very often from the living room of the volunteer. Controllers start duty at 7pm and work till 7am throughout the week, as well as on Christmas Day, Boxing Day, and bank holidays. If the control gets a run of calls, bikers may have to make two or more journeys in a night, and might not get home until 5am. Controllers wait for a text from their riders to tell them they’ve made it home safely. Some requests are classed as Priority 1, that is life threatening emergencies, and obviously motorbikes can get through traffic much more easily than cars or vans. But despite the urgency, and the bikes being provided with blue lights and sirens, the bikers have to stick to the speed limit and stop at every red light. The intelligence services, bomb disposal units and the coastguard operate also have to operate similarly. As a result, the blue lights are of limited use, as there are no exceptions. It would be confusing for the public to see the lights used differently. This may be change though as in 2013 the government issued a consultation paper on allowing the blood bikers the wider exemptions allowed to the ambulance, fire and rescue, and police services, subject to the appropriate training. The Department for Transport has recently announced that the regulations will be changed accordingly next year. One reason why the bikers look set to be given the same exemptions as the other emergency services is the ‘golden-hour response’ sought by the NHS Blood and Transplant service. This refers to the treatment of a patient in the vital period immediately after an accident. This means that one of the bikers is able to get to any hospital in their patch within the hour in order to transport organ tissue samples to another location. It is likely that the natural camaraderie that exists between motorcyclists plays its part in the commitment that keeps the volunteers going, but the vital nature of their work must be the major factor even though the bikers will rarely know what became of the samples they deliver around the country. The blood bikers are one of Britain’s best kept secrets. 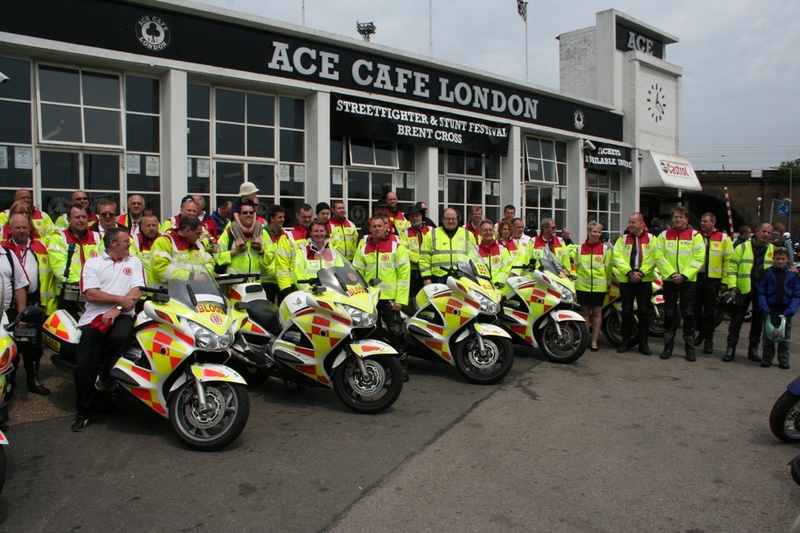 Blood biker groups need volunteers and financial help. If you can spare a few pounds, you can visit the NABB’s donation page here. They also have a blog.